The legendary “Road to Hana” drive seems to indicate that the town of Hana itself is the goal, but you'd be crazy to miss a visit to Wai'anapanapa State Park. Spending some time in Wai'anapanapa State Park is reason enough to stay overnight in Hana. 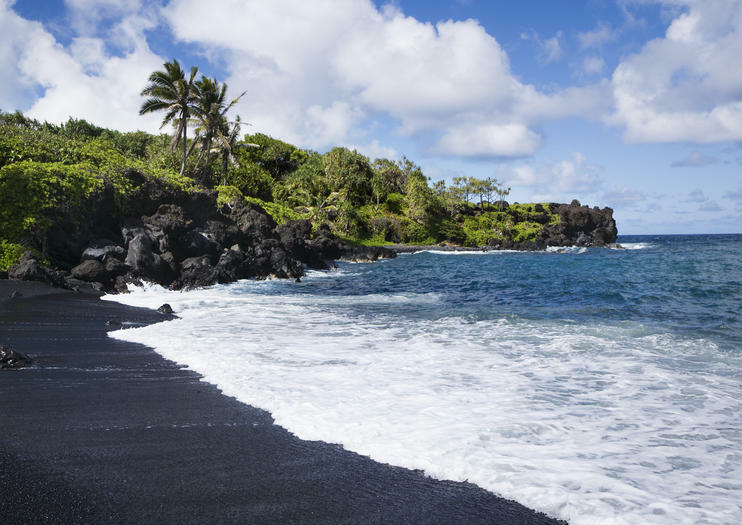 It's a lush and gorgeous park just outside of Hana, and one of its most well-known features is the small black sand beach of Pa'iloa. It's a beautiful beach, to be sure, lovely for swimming or simply sunbathing, but there's more to this park than just a beach. Wai'anapanapa has two underwater caves you can visit that are filled with a combination of fresh and salt water. You can go swimming in these pools, too. This area also has historical significance, too, as you'll see when you visit the ancient burial sites. There is also a trail that winds three miles along the coast, from the park all the way into Hana Town itself. Wai'anapanapa State Park is located at mile marker 32, just before you get to Hana. There's no entry fee to get into the park, and parking is also free. There are camping facilities, including restrooms, drinking water, and outdoor showers, so you can spend the night here before heading back on the Road to Hana. Island hop from Oahu to Maui and see a second island on an action-packed, full-day tour. Perfect for visitors who are short on time but want to experience some of the magic of Maui. Your guide narrates as you travel across the island in a climate-controlled mini-bus, stopping at many sights during the day. See tropical rainforest and waterfall views, taste local treats and stop in the charming town of Hana. Keep your camera handy for photo opportunities. See the scenic highlights of Maui in a single trip. Journey along the famed Road to Hana, a unique drive with more than 600 curves and 50 one-lane bridges, to take in the views of the island's valleys, beaches, and waterfalls, while getting an introduction to the history and culture of the people who call it home. Swim in Pua’a kaa Falls, hike in Wainapanapa State Park, stroll along a black sand beach, and enjoy breakfast in Pe’ahi, home to the Jaws Beach, famed for its big waves. See the best of Maui in a single day trip on this guided tour that allows you to not only see the sights but also to experience the history and culture of the people who call the island place home. Journey along the famed Road to Hana, a scenic route with more than 600 curves and 50 single-lane bridges. Stop in the historic Keanae Peninsula to take a swim in the cascading Pua’a Kaa Park Falls, hike through Wainapanapa State Park and black sand beach, and check out the big waves at Jaw's Beach. Guest will experience one of the most beautiful coastlines in the world on our journey back in time to "old Hawaii." Take in the stunning forests, waterfalls, exotic plants, and local fruit stands along the way till we reach Heavenly Hana. A cultural stop at Pi'ilanihale Heiau, the largest ancient man-made structure in all of Polynesia, the Hana Cultural Center, and beautiful Wai'anapanapa State Park gives you great insight into life in ancient Hawaii. Our vehicles are new luxury 11 passenger vans with high-back reclining leather seats and large high-visibility privacy windows. Aloha Hawaii Tours is a five star rated tour company that offers amazing guided experiences on Oahu and Maui. Our Hana Coastline Tour is one of only a few that goes all the way around! Let us drive- you relax and enjoy!